Another win! Palm Beach in Florida! I am sure he will be collecting lots of awards with EXAM very soon, it’s a very special feature film. More on that in die course. In the USA, Gone Fishing AP Kerry Finlayson is repping us at the very prestigious Newport Beach Film Festival right now, which really looks great!. In fact this weekend in LA we have several fests playing all at once, including the Hollywood First Glance Festival, and Kerry is of course attending them all, if she can get between them all fast enough that is! And on Monday she jet sets off to Cannes! Madness! We will let you know how we get on! I am putting together a fascinating workshop for the corporate sector, about using video webisodes as a way to promote your business and brand. I was asked to do it by Actix, who had previously sponsored Gone Fishing. They had seen the extraordinary responses I had been getting from the webisodes at the festivals and wanted to bring that craft and technology to their web presence and brand. The workshop is being attended by top brass at Actix, so no pressure! We are presenting the workshop next week, and as part of the actual event, we will be getting the delegates to make two webisodes during the day. Let’s hope we pull that off as it’s a tall order. Putting together the presentation has taken some time as I wanted it to be as detailed as possible, and peppered with real life examples, not just of my own webisodes, but also from others, some of which are astonishingly successful and getting 20 million hits on YouTube. Simon Cox will be working with me through the day, shooting, assisting with technology, but mostly editing at 2000mph in order to deliver the completed webisodes by the end of the day. The video here is one of the most amazing viral successes of last year (currently 21 million hits on YouTube), so much so the conspiracy theorists declared it a hoax. They then came clean and admitted it was a hoax... You can watch that here. But you gotta love'em, the Coming clean, it's a hoax, was in fact a hoax! The original is authentic. Talk about getting mileage out of it! After next week, I hope to deliver this seminar to other companies too, to help their staff get shooting their way to success! If you know anyone who may be interested, drop me an email. Finally I am getting my head around Twitter and what it can really offer us all. First off, the video here is from TED and is a good background to the creation of Twitter. Well first off, you need a computer desktop version, you can’t rely on the website as that’s just too many clicks to get to the good stuff. I use Twhirl which sits on my desktop and beeps when I get a tweet, and is easy to add tweets to when I want to. I have also set my blog up to automatically tweet when I update too. That’s pretty cool. The other thing I have relaised is that I really need to get Twitter on my phone. I have an ancient phone and have been locked into a contract which will expire soon and I suspect I will get an iPhone and can tweet on the move then. For instance, it would be great to Twitter from the End Of The Pier Film Festival Awards this Saturday night. But right now, I can’t. As for the Tweets? At first it feels kind of odd, until you get people tweeting back, and then you are in a conversation. I am starting to get hooked on it and I don’t know if that’s a good thing or a bad thing. I have just been asked by the organizers of the Heart Of Gold Film Festival to Tweet Hugh Jackaman as (in their words)… Hugh is giving away $100,000 this coming Friday to a charity or not for profit (we are not for profit). You just twitter him about it - the one people are most passionate about will win! So I have done my bit and who knows, they may even win. When I was in LA, my manager Andy Trapani, who also produced The Haunting in Connecticut, told me when the film was released, they did a search for the film on Twitter (there is a word search engine on the Twitter website) and got real time feedback from audiences as they twittered each other, unaware that the film makers were listening in – seems Twitter is a great tool for getting honest feedback instantly. Last night I attended a screening of Gone Fishing in Worthing, on the South coast near Brighton. It was part of the End Of The Pier Film festival and run by Brian Gartside. I like Brian a lot as he is committed to helping film makers, so much so that the festival invests a portion of their profits into films and film makers. Gone Fishing played in a very eclectic program of ten other films, the highlight for me being a very clever and well constructed movie called ‘Mother Mine’, directed by Susan Everett. Susan contacted me some time ago and sent a DVD as she had entered the TCM awards and did not get in the final six. On reflection, I thought her film deserved to be in the last six at TCM and was certainly, in my view, better than several of the other finalists. I am sure her next film will be one to watch out for. I also met up with the Silence Within boys, the band how we made a music promo for last year. This was their home turf and they very graciously attended to support the film. They cheered and whooped like rock stars as the end credits rolled, so thanks guys. THE GUERILLA FILM MAKERS MASTERCLASS REDUX 2009! GET YOU MOVIE MADE NOW! The Guerilla Film Makers Masterclass will be run by the author of The Guerilla Film Makers Handbook and Movie Blueprint, Chris Jones, and will be held at Ealing Film Studios over the weekend of June 26th / 27th. If you want to come, call 020 8758 8544 or 07977 516 628 and and speak to us. Or email us at mail@livingspirit.com. If you get the answerphone, leave a message with your phone number and we will get back to you. Hope to see you on the course, and look forward to a rollercoaster weekend! What is the course and who is it for? It was put together by the authors of The Guerilla Film Makers Handbook to manage the overwhelming amount of enquiries received from new and young film makers. Too much time was spent helping others and not enough on making their own films, so it was decided to organise weekends, whenever convenient, to answer as many questions as is physically possible in two very very long days. The two day event covers everything from your films conception to it’s completion and all the way through screenplay, production, sales and distribution, with a new special emphasis on theatrical and video distribution. There’s special emphasis and problem areas such as business structures, legal issues, post production, getting the best cast, marketing, markets, and of course, the all important international sales. STOP PRESS - We just ran the Guerilla Film Makers Masterclass REDUX 2009 in Australia to RAVE reviews! AND NOW BACK IN THE UK FOR THE FIRST TIME IN THE UK FOR 18 MONTHS! As you may know, I am flitting between running some courses and writing a script – and in the darker times of the script writing, I often start to wonder if it’s all a kind of madness. Will creativity ever be diagnosed as a clinical disease? Possibly I think. I found this exceptional talk from TED with co-creator of Lost, JJ Abrams, and his energy and insight I found illustrated that this is in fact a kind of madness, but in a good way! I chuckled all the way through and found myself inspired to hit that blank page again. Thanks JJ! I hope you enjoy it just as much as I did. I have spent the last day putting together a one day seminar about film sales, and specifically how to make final delivery to a sales agent or distributor. I have sat in on several sales meetings recently and have been surprised at how much stuff these guys need or want, and also how technical it can be too. ‘Making Delivery’ is the final hand over of the film from the producer to the sales company, and on the face of it, sounds simple. Sadly, it’s far from simple as they require so many items that seem, to the film maker, esoteric and pointless. Indeed some of these items are and any good producer would negotiate this list down. How much you haggle down that list of items could save you tens of thousands. Really! But some stuff really IS needed, and without it they can’t sell your film. Five (5) signed and notarised original Certificates of Origin and five (5) Certificates of Nationality Certified by the official applicable government body in the country of origin. One (1) DA88 6-track Print master manufactured from the 6-track stereo master. This must be in perfect synchronization with the PAL Digi Beta Video masters, with a matching continuous time code. So are you ready to deliver these two items for your film? The list I was working from contained nearly 100 items! And all need to be understood and delivered. My take is this, understand exactly what everything is, negotiate what you know is needed and why, and then build that into your budget. Either you pay for it, or the sales agents will, and they will deduct it from sales (and they won’t do it on the cheap like you could). I hope to officially announce the course in the next few days. Festival Grid Lock... and we are going to need a bigger shelf! 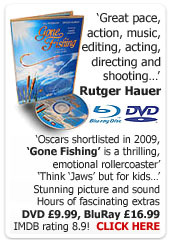 I am looking at a frantic couple of weeks for ‘Gone Fishing’ at international film festivals. Over the coming two weeks we will have umpty thrumpy screenings around the world. All are in the USA and the UK, and it has already kicked off with the Nashville Film Festival where Gone Fishing screens today. The density of festival screenings highlights two problems for film makers. First, even if I could afford to attend, which should I choose? Sadly I am broke so staying home, though at least two ‘Gone Fishing’ Associate Producers are attending in my stead - Kerry in the USA will hit several fests, and Louise Stegalls from my home town of Wigan, will be attending the Cape Fear Film Festival. We hope to get a report from them both while there. The second problem is that of servicing these festivals. I have pushed to screen 35mm where possible, but prints are expensive and we have a limited amount of them. Of course if a festival CAN screen 35mm, it tells me that they are serious. Some festivals will also screen HDCam which is great, or DigiBeta, which is passable, or DVD which is rather tragic given we all put soooo much energy into getting the completed to such amazing standards. So shipping prints, tapes and DVD’s becomes a bit of a logistical nightmare, and is often referred to as print traffic. Then there is the cost of shipping posters and press packs, the time it takes to fill out B-side etc… I have said it before, but its like a full time job. Right now I am down to my last 35mm print as all other six prints are at festivals around the world, either being screened, sitting and waiting to be screened or in transit. So fingers crossed for Kerry and Louise! Blimey! We really are going to need a bigger shelf! Gone Fishing with a talk from the director, The Roxy this Thursday! This Thursday (April 23rd), as part of the London Independent Film Festival, I will be running a one hour seminar and screening Gone Fishing at The Roxy Cinema in East London. The event is part of an evening of Music Videos and the best of UK Short films and costs just £3! You can buy your ticket here (look for the Music Vids and UK Shorts Evening pass for Thurs April 23). Apparently there are only 100 tickets on sale, and I guess some of them will have gone now, so if you want to come, I would get busy. I have one hour to talk, which will include screening Gone Fishing. The whole event kicks off at 6pm and I am onstage at 7.30pm. It promises to be a great event and a chance to see a bunch of terrific shorts too. Yes it says a thousand words... Barack Obama visits number ten. Remember they are not supposed to shake hands. I've just finished writing the spec-script for the idea you proposed to us in our meeting after the Guerrilla Film Makers Masterclass. When you suggested it I said I could do it in a week and it's now been two, but it feels great to have a 96 page commercial script in my hands as I write this. Okay, so here's a bit of background. Prior to coming to the course, I'd completed writing and directing a bunch of no-budget features (along with my once girlfriend, now wife, Candice who co-wrote and produced all of them), and had been in post production on our current no-budget feature. Around five years ago, I decided that the best way to learn my craft, would be to get out and get as much experience as I could, 'perfecting the formula' of making features from start to finish - so if one day someone said to me and Candice 'here's some money to make a feature, can you do it?' I could say 'of course, we've done it five or six times and can guarantee this level of quality' which I figured would be looked on favourably (even if they weren't perfect, the fact that I'd made ninety minutes of comprehendible story with a couple of thousand raises a great question- 'what could these guys do with a couple HUNDRED thousand' or my dream- '...a couple MILLION'). So I was in post for a month onlining my fourth feature, looking at the footage thinking 'This is my first movie that I'm actually gonna SHOW people'. It was PERFECT that I reached this place before attending the course... because I never could've imagined how it was going to change my life. I arrived, and from the first day I knew that this... meeting Chris Jones himself... was a catalyst in my life. ...so here I was, lapping this up. Feeling perfectly validated, this is EXACTLY what I've experienced to this point and only in the last couple of weeks, have realised that I've started getting to the GOOD STUFF! Our movies are getting to a place where they might actually be considered GOOD by someone other than our buddies. But then you hit the group with the STAGES OF PROGRESSION IN A FILM CAREER. You told us how most people probably thought they were a stage ahead of where they really were, but I knew exactly where I was. Sitting comfortably at the later part of Act 2. After the first day, I was feeling pretty good. I'd definitely been validated in that what I'd been doing up to this point had all been right. I'd ticked every box with my plan. But I could already smell a rat. I could sit in this space comfortably for the rest of my life - get a day job, have kids, and make movies for the fun of it at a fairly high level, for not much of a loss - there was only one problem with that (which I knew prior to the course), and that was that at age 22 I'd set a goal for myself that by 28 I'd be making money making movies (as a point of reference I turn 27 this Saturday). I didn't want to be Spielberg (yet) by 28 or anything, but I definitely wanted to at least be a blip on the radar of the film industry - and my definition for that was to be being paid to be a writer/director. So on day 2 of the masterclass, in the first session when you went through the (your) start to finish process of actually making a movie, the penny dropped. It was time for me to move into stage 3. You'd taken the course from giving VALIDATION to building CONFIDENCE. It was a scary thought, but I realised that in the course of doing that first day, then arriving on the second one, I'd just crossed the act 2 turning point on Stage 2. There was no more going back... it was time to (figuratively) save the world (get my last movie done, released, and start on my path to making my first commercial feature, moving eagerly onto Stage 3). I was so excited that in the break I came and basically went .... blah la la la oh la la blah la la WOW la la ....to you and tried to explain the whole process as it had happened in my mind and how profound a change in me you'd instigated, without really even directly addressing me and my situation. I remember your reply was (to Candice who was silently standing next to me listening to my rant) - 'Is he always like this? ', then back to me 'Blimey! THAT was an experience.' You told us how it was great for you to help, and that it helped you to help us. At that point there was no denying you'd served as a mentor figure for this part of my journey, and that no matter what the afternoon contained, I was ready and raring to take on the world. The day finished, and elated, Candice and I went to the opening night of the festival with you and saw Gone Fishing and how it affected the crowd positively. Afterwards we said bye, and drove home. The next day I was back to my renders. I finished work on another scene and set it rendering. I checked my email, and there was an email from you saying you wanted to meet with us again. I was ecstatic! We drove back down on Sunday to meet, talked about a bunch of stuff, and you gave me an idea for a spec script. I said, 'Well, I'm onlining my movie basically 24/7, but what the hell, I love a challenge, I'll have a script to you by this time next week.' I think you probably thought I was a little nuts, but wished us well and we left the festival for 2009. The whole drive home, Candice and I started brainstorming ideas. When I got home I did more movie work, then set something rendering and went back to spit-balling ideas for the movie. After about three days we moved from idea stage to writing. It was a trip ‘cause it was a specific genre script and was absolutely unquestionably a commercial idea. So here we were, for the first time, writing a movie on spec that we (scarily) couldn't shoot without money. I sent you a Skype message the minute we finished it. Then we went and grabbed some Burger King so we could eat and reflect and on our achievement, and while sitting there realised that the last time we'd been in there was around two months ago, the day we finished production on the movie we're now almost finished. There we were, with an almost finished feature, and a script that was gonna make us money. We came home, and here I am, finally getting a spare minute to email you and thank you properly for the life changing experience you gave us with the masterclass. Thanks Chris. From here, we'll probably rework it and get started raising money (something we haven't done before), while screening our new movie at festivals. It'll be amazing experiencing the process of working on a movie to sell, and I can't wait to see where it leads. I know my life has changed for the better as a result of you meeting me, seeing something in me and Candice as a film making team, and giving us the courage to push that bit harder, to take our work to the next level. I turn 27 this week, and thanks to meeting you and doing the course, I just might reach my goal of making money from my movies by age 28. I've got a year and a week. Let's do it...onwards and upwards...heh. And I am now planning dates to run the Masterclass here in the UK in the next month or so. When I was in LA, I met with film maker Alex Fazeli, shot an interview, and I wrote about it on the blog at the time. His interview is a bonus feature of the now, 14 hour Guerilla Masterclass: Making The World Class Short Film, that is delivered totally online. His interview is about his experiences while on the festival circuit with his 35mm short, ‘In The Dark’. Just after the interview he won the Bermuda Film Festival, giving him the all important Academy Award Qualifier, so he is now in the running for the 2010 Oscars. This kind of strategic film making is essential if you think your short is a possible Oscar winner, and that strategy is something that we go into detail about in the completely new addition to the online seminar, a further 2 hours about short film sales, exploitation, festivals, awards and of course, The Oscars. Make no mistake, winning awards and especially an Oscar is NOT just a matter of turning up, it’s a political and strategic chess game. I shot the interview with Alex completely alone, and it was the first foray into self shooting 2 camera interviews with now crew at all! There was lot’s learned! If you are interested in this online course, it’s still only £69.99 but will go up in the next few weeks. This is to reflect the all new content that has been added to complete the whole journey, from first world class idea, hopefully all the way to the Oscars. You can get the online seminar here… And remember it’s all online, so you can start RIGHT NOW! Tue, 3/17/09 7:09 PM Insights, Strategies and just plain common sense filmmaking from the heart of a filmmaker who understands and is able to pull off an excellent film. 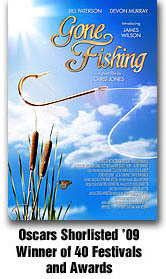 Chris Jones adheres to his mantra of 'excellence' in the undertaking of his film Gone Fishing and the Seminar Series. Moreover, he has actually made a film which is well... Excellent. I first viewed this film with my two sons, John 10 and Sam 7. Upon the first shot of the fish accompanied by a deep almost foreboding score my son John exclaimed, 'This is like Jaws!'. Chris has referred to Gone Fishing as 'Jaws for children'. We enjoyed the world that Gone Fishing propelled us into. We will eagerly wait for Chris' next project! The Gone Fishing Seminar: I found this filmmaking 'how to' seminar refreshing for two reasons. 1. The presentation comes across as sincere and spontaneous! Not canned like most filmmaking seminar or courses tend to be. 2. The Case Study film is actually GOOD! This is rare. Most filmmaking training courses must site popular films. This Seminar uses the actual film that was nominated to be nominated for an Academy Award. Again this is also very refreshing. The Seminar is very valuable to anyone interested in becoming a filmmaker or venturing into any field of filmmaking. I am so grateful for this course if for no other reason than I can watch the case study film by the filmmaker and NOT have to say, "I can do better than that!" Excellent Film. Excellent Seminar. Thu, 4/2/09 11:55 PM For Newcastle United, it's "Howay the Lads"; for this one Newcastle film-maker, it's "Howay Chris Jones"! I was lucky enough to attend Chris's "encore" performance of the first "Gone Fishing" seminar, not at BAFTA, but at the Film School College that's attached to Ealing Film Studios, on their back-lot (notice how I've typed "encore", instead of the more British word "repeat" ;), and despite the weather being absolutely depressing that day, and the train journey there and back from Newcastle, it was an outstanding, thought-provoking and well-produced masterclass (NOTE: apologies Chris if I was fidgeting whilst sat on the front row, while you were talking; you can actually see my ginger head popping up and down a few times). When I heard he was giving a follow-up masterclass, this time on his experiences with film festivals, sales and distribution, and I couldn't make it, I was disappointed to say the least. But, I was so glad when he announced that he had every intention to provide the "sequel" seminar to those who had already attended his first 2 production seminars on "GF". And, after watching every single section and video, and as cheesy and cliched and predictable as this will read, I have never been more inspired to begin work on my own World Class 35mm Short Film, and take a shot at the Oscars myself. Granted, I am coming to the end of only my 1st Year at the fantastic Northern Film School in Leeds (but with only 1 year remaining on the course), but I graduate in the Summer of 2010, and hopefully, by then, I will have experienced the festival circuit myself with at least one five-minute very-low-budget comedy short, that I intend to direct and produce at the highest quality level of my abilities and capabilities, and afterwards, use both mine and Chris's enormous, full-of-wisdom and intelligent experiences, and both learn and adapt to those, in the hope of making it as successful and as big as him, and opening as many promising opportunities to myself as he has for himself, with my own World Class short film/script. Back here, in Newcastle, the fans of our football team regard former manager Kevin Keegan as "The Messiah". Well, I believe that everyone, who HASN'T been successful in the film industry yet and/or totally aspires to, should regard Chris as that Messiah. Take what he has learnt and what he has done, most of which, if not all, at his own very great and personal expense, and make a film that you like, not one that you are only making, just so you can win competitions and awards, because the bright-minded people of the industry and the world, will see right through you, and I also believe that, when you make a film that you like, and from that likeness comes your deepest and most heartfelt passion and love for that very film, just like what Chris has done and conveyed to numerous persons across the globe, the opportunities, the success, the fame, the fortune, and the respect, will come to you, and not the other way round. At least, that's what I'm hoping happens to me some day. Gone Fishing Gets a Theatrical Release! I have teamed up with old film school buddy, Julian Richards, to release ‘Gone Fishing’ as a support for his feature film 'Summer Scars', which is released in cinemas this June. This is great news as it means that Gone Fishing should play around the country in cinemas, and it’s a wonderful revival of the old short supports a feature model that was phased out when the US multiplexes began to dominate distribution in the eighties. Details are still sketchy, but one hurdle that I will need to overcome is the fact that we will be presenting digitally (though we may also present 35mm in some theatres). 'Summer Scars' was shot on HD and we are now looking at creating a version of the film in the Digital Cinema (aka D-cinema) format of JPEG2000… Like we need another format! If you are providing the content in digital form, it must be in a JPEG2000 format that meets the SMPTE 429-6-2006 D-Cinema Packaging standard, to be loaded into the servers. These units will playback either 2k or 4k content. It’s a completely new format and development for me so I will report back what I find. I even want to see this hard drive and how its ‘plugged’ onto a projector the other end, and hopefully, find out a way that its possible to make this file yourself at home (though I am informed this is not possible). Maybe the film can even be delivered on a DVDr asd a file to be copied to servers? All will be revealed in due course. As for revenues, it’s very unlikely that we will make any money out of this release, but you never know! Both Julian and I have committed to attending designated screenings to do a Q & A session after the films, to add a little value so we may see you when it’s playing in your town, if we make it to your town that is! There’s a new kid in town...! There’s a new kid in town, when it comes to online film festival support systems, called B-side, and its being rapidly adopted by lots of festivals. Frankly I have been swamped over the last few months and when I got an email from a festival saying ‘you should add your information to B-side…’ I must admit, I groaned. Here we go, yet another online system to learn and drain more time and resources. Gone Fishing has been to a myriad of festivals in the US lately and a few of them have had partnership with a company called b-side who provide free festival programming interfaces to over 200 North American festivals. Each festival has its own B-side webspace, and they are all similar in format but are customised and integrated to the festivals own website and provide a full interactive festival programme. Filmmakers can upload stills, trailers and import their film blog, while audiences can schedule what they will see to their own calendar, rate and review the films and share their festival experience both on the site and via Facebook and iPhone apps too. Though at first I found it rather an odd novelty, I can see the benefit of an interface where filmmakers (as well as festivals) control the information used so they can manage audiences during a festival, as well as giving people greater access to their films and themselves. Of course, it is an extra task for filmmakers to complete, and the onus does tend to be on the filmmaker to get the relevant information uploaded. If, like ‘Gone Fishing’, your film gets into multiple festivals that use B-side, the page information files including all the stills, trailer and blog can just be copied over to the new festival by way of a quick email to b-side. Again it’s up to the filmmaker to check the page and ensure the info is there. The technology is not difficult to get to grips with and the guys and girls at b-side are friendly and helpful if you need to email them for assistance. The upside of b-side is that compared to other social networks like Facebook, Myspace and Twitter, b-side is a way to directly connect with the people attending the festivals your film is playing in. It’s a little under-used at the moment. We haven’t seen much web feedback for Gone Fishing’s pages despite some large audiences at the fests, but that might just be due to the current technological learning curve we are all going through with networking applications. So sure, there’s room for improvement, but I think over time, technology like this will grow and as people become more accustomed to sharing and interacting electronically, I think sites like b-side could prove to be a great asset for indie film. All in all, b-side seems to be a basic but useful tool for festivals, filmmakers and audiences at present, especially those who take the time and trouble to use it to their advantage. I’d be interested in seeing a European equivalent. Thanks Leilani for sharing what you learned, and thanks for taking the time do it in the first place! A question I am often asked about the video webisodes is, ‘how do you film then when you are on your won…?’ in short, I grab someone and put the camera in their hands and say, can you point this at me please? And away we go. Occasionally, I am lucky enough to find a person who is really interested in getting involved, and one such person is new film maker Ryan Dustin. I enlisted Ryan at the Sedona Film Festival, you can see the blog here, and he had a great time shooting. I gave him a few lessons on the spot and he hit the tarmac running. It’s 6:00 P.M. on a Friday night and a blizzard has just knocked out all of the power in Flagstaff Arizona! The roads are buried in snow, and you can’t see 5 ft in front of you. The 2nd annual Northern Arizona University Student Film Festival is less than an hour away and it doesn’t look like anyone is going to be attending. This is horrible, considering the fact that a spectacular short by Chris Jones called “Gone Fishing” is going to be screened; you might have heard of it by now! friends and the other staff. 20 minutes later, the library theater is filled with 90 plus students, I still don’t know how it happened, but it did, thank GOD! We start off the festival with 3 Looney Tunes shorts, and then we get into the main attractions which consist of other wonderful shorts by film makers across the country. The fourth and final short is “Gone Fishing” and I strut up to the mic with confidence and introduce the film, the lights dim and I get excited. The end credits roll, and with them comes an outburst of applause! The students absolutely loved it! Afterward, the film students were so excited about the film and were saying, it was one, if not the best short films they’ve ever seen. The cinematography was outstanding, the story was lovely and beautiful. So even a blizzard couldn’t keep students away from seeing the award winning “Gone Fishing” which was a complete smash hit! It was the talk of the festival! Thanks for letting us know how the film played in snowy Flagstaff Ryan! Great Write Up on IndieFest.com! While I was in LA I did a great interview with IndieFest.com. It was just after I got back from Heart Of Gold and the weird jetlag combined with the very large café latte I had just drunk made for a particularly entertaining phone conversation with the delightful journalist, Laura Lee. Can we have... the most obscure, low quality format available please? I try to be as prepared as I can, and I try to carry around with me the technology to deal with anything that is thrown at me. I have recently been tested to the max by a film festival though. They can’t handle 35mm. OK. So they want a DigiBeta NTSC or other tape. OK. Shame, but OK. Oh and they don’t want it in Anamorphic either! This is a format that I would have never expected I could be asked for. Add to that they wont screen DVD’s either and I am faced with having to create a whole new master of the film. Thankfully I have on my portable hard drive, the movie mastered in 720P HD (with Avid Codecs) at both 24P and 25P. So I am using Canopus Pro Coder to downcovert and transcode the 24P 720P to NTSC with NO anamorphic squeeze. Crazy. I will then need to find a DV camera and use my Avid on my laptop to play it out to DV tape. Even crazier! This really does echo several of the points that were included in the Gone Fishing seminar, in the new section I have just completed editing, about how festivals can ask for very odd stuff, and how you need to be prepared for anything on the road. Hey, it's their festival so they are the boss! BUT... I have been thinking, having visited so many festivals, I may draw up a wish list for festival organisers. Most of what I would ask for is pretty simple, stuff like, if you are going to have a pro photographer take a shot of the winner onstage holding the trophy, then can that be available the day after for PR. So far I have NEVER been offered these pics, and when I have got them, it's only after seveeal emails (the exception being Heart Of Gold where I got to know Pancho, the photographer). Postcard from Guest Blogger Cathy Arton, Casting Director repping Gone Fishing at the ONFilm Festival, Virginia! While Chris was at The Heart Of Gold film festival in Gympie, Queensland, I am at a film festival with a lot of heart! On Wednesday 18th of March I get an email from Chris, telling me that we have been selected to be in competition at the ONFilm Festival in Norfolk, Virginia. Would I go in his place and represent ‘Gone Fishing’. Hurrah! WOW! Honored, delighted, 6 days later I was in the air on my way. Two planes later, I stagger out from Norfolk International Airport (Not drunk, just exhausted) to my complete relief I hear a warm and welcoming, “Catherine is that you?” Lane Dare, director or the festival, comes rushing up to me, gives me a huge hug and kiss, helps me with bags and bundles me into her car. Lane looks as though she has just stepped off the lot in Hollywood, she could be an actress or the president of the studio. As soon as we are seat belted up we are off at a speed only to be matched by a formula one driver. Scarier still, Lane roots around in her handbag on the floor, looking for her ringing cell phone and then pulls down the mirror to apply some lip balm. As I did before the plane took off from London I quietly say a little prayer to myself. I quickly discover that Lane Dare does everything at the speed of lightening. I have never had the pleasure of meeting anyone quite like her. Lane has been in broadcasting for years, in front of the camera and on the radio. In her home library she has loads of language books. On asking why, she nonchalantly says that when traveling to a country like Russia or Japan she like to learn the language first so that she can get the most out of her journey. Seemingly, if Lane is interested in something she becomes a master of it. Lane loves film and the arts so now Lane is the director of an international, competitive, film festival. Day 1 - I wake up at 4:30am, which at that point is 8:30am London time, so as the mother of a 5 year old, feels like a lie in. What to do now, where to go next. I am jet lagged and not sure what to do. After a couple of hours I hear the others getting up and after a few homemade espressos it is suggested I stay at their home and Lane will be back at 4pm to come and get me, as that night is “A Conversation with Richard Dreyfuss”, the official opening event for the festival. Okay, I have had a crush on Richard Dreyfuss since I was a precocious 10 year old. After seeing him in The Goodbye Girl, that was it! Chris is also a huge admirer of his talent. I am guessing more after Jaws and Close Encounters. Of course I had already picked out my outfit for the event, BUT what to say as I push my way through the expectant crowd to meet him. I have time to do some research, I go onto You Tube to discover Richard Dreyfuss is a proactive campaigner for the need for Civics to be a part of the national curriculum, to be taught in schools. He is an intensely proud American who wants to get fellow Americans on board, to be proud in their country, to take responsibility for self and country and to protect their country and their very precious civil liberties. I further learn that tonight’s “A Conversation with Richard Dreyfuss” is indeed about this political stance and not particularly about his remarkable film career. I am moved by the passion I see in this incredibly intelligent good, good, kind man. Therefore my opening gambit will be to thank him for using his fame for a tremendous cause. The evening of the talk arrives. As predicted I push myself forward and we are locked in conversation. Me and Richard Dreyfuss, ah! I become increasingly aware of a maddening crowd as I am hogging the man of the hour, I excuse myself, to later go back for some more. With his intense blue eyes and commanding presence, Richard Dreyfuss has the ability to make you feel as though you are the only person in the room, as though you have known each other for years. I have been asked not to film the event so I, accidentally, on-purpose, got a little bit from the talk. Oddly enough, the only bit that was about his career. I then got a gentle tap on my shoulder and switched off the camera. His enthusiasm spread through the crowd like a wild fire. Many of us from abroad, Britain, The Netherlands, Israel, Australia, South Africa, within moments he got us all to stand up and Pledge Allegiance to the Flag of the United States of America, we all willingly jumped to our feet, stood and Pledged our Allegiance to the Flag of the United States of America not one person sat. In that moment I too wanted to be an American, I felt grateful for the idea’s behind ‘The American Dream’, Free Speech, The idea of global security. Interesting as under the Bush administration I could be heard on countless occasions, to say many a scathing remark in regard to the US. Now with men like Richard Dreyfuss championing his causes and the dawn of hope permeating the ionosphere under the Obama administration all bets are off and America now seems instantly more like the country I grew up next to while a child, in Canada. Day 2 - On the phone and on my arrival I had asked for some help hopefully from some eager film students or interns. To quickly discover that there seemingly were none available. Yikes! Although, the film festival has being going for the last 11 years as a retrospective festival, this was the very 1st year that it had been opened out to international competition. Another day at my kind hosts home until Lane could come and get me. Tonight was the screening of the highly acclaimed ‘Swimming With Sharks’ with it’s fiercely intelligent, charming, dynamic, producer Stephen Israel, chair of the jury for the ONFilm Festival, in attendance. Stephen has been brought on board by Lane Dare. Stephen has long family roots in Norfolk, Virginia, although British-born, and now an LA-based film producer. Stephen Israel, was one of the earliest supporters of the Slamdance Film Festival, the counter-programmed festival that runs in Park City, Utah, at the same time as the Sundance Film Festival. "For the longest time, the only way for more specialized films to find a larger audience was at film festivals," Stephen offers. Stephen is now committed to making the Onfilm Festival for Indie film’s as superb and marvelous a competitive, international film festival as possible. I give it 2-3 years to get into it’s full stride. Day 3 - I have realized that I need to leave the house with Lane in the morning. I am up and ready. After all I have been awake since 5:30am. Today are the student film awards. At the awards I can see that there is a lot of up and coming talent. Tonight is the first screening of Gone Fishing. The weather report is not good. Gale force winds and driving rain, which comes to pass. I couldn’t believe that anyone would venture out in that kind of storm but they did. Gone Fishing was screened along with The Coffee Break, a wonderfully powerful film about 2 police officers taking what should be a harmless coffee break which turns into, a question of gender identity, bullying, fear and humiliation. Also, About Face, a very funny film that takes Facebook to its literal conclusion, and finally a feature documentary by Jan Louter. A very important film about the last days of an entire society and it’s people as the island of Shishmareff is disappearing into the sea as a direct result of global warming. The island has between 5-10 years left. The people of the island have to move but they need governmental aid to do so as they live off the land and do not have the financial ability to move to the mainland. It is called The Last Days of Shishmaref. Day 4 - Today there are a few more screenings of Gone Fishing at a wonderful old theatre called the Naro, which dates back to 1936. I will go to scope it out and to do a sound check for levels. Today I am having breakfast in a typical American diner near to the cinema, with Stephen Israel and Lane Dare. Tonight are the awards. I am looking forward to it. The Awards ceremony - Okay WE WON for best short film. I go up on stage thinking, Sh*t I wish I had written something; Chris always makes it look so effortless. Yikes! It all went into a blur and slow motion. Someone puts the awards in my hands and veteran film critic Mal Vincent is congratulating me, and suddenly there is a huge blown up picture of Chris as Chris had pre-recorded an acceptance speech just-in-case. Whew, I think, I don’t have to speak. Then it happens, Chris is apologizing for that little gaff at BAFTA and thanking me for all of the 20 odd years we have worked together, and for my contributions to his filmmaking. Luckily my back is to the audience as my eyes projectile spurt out tears and I am shaking and completely choked up. I managed to momentarily pull it together to turn around and say something to the audience. It was such a kind and generous speech so typical of Chris Jones! Working with Chris is always inspiring! He is one of the most talented people I have ever met. He has a way on set that makes everyone feel as though they have a say. It is always a truly collaborative event. You know I have seen Gone Fishing umpteen of times and each time it gets me, and I tear up. That is a true testament to the great collaborative filmmaking behind it. I am so proud of everyone involved. Our wonderful actors, Bill Patterson, Lin Blakely, Ruth Gemell, Devon Murray, James Wilson, Eddie Hamilton our amazing editor, Vernon Layton our incredible Cinematographer. And of course our intrepid director Chris Jones. Speaking with Mal Vincent after the awards was one of the highlights of my trip. Mal Vincent was one of the Jurors for the festival, Mal regaled me with stories of when he met Bette Davis and Audrey Hepburn, Angelina Jolie well the list goes on. He was so generous putting up with my endless questions. I also, got the distinct pleasure of speaking with Jeff Cooper, Doug Wedeck and his lovely wife Mara, actually I met so many interesting people all with a love and passion for film, that it was bliss. Time to go home to the UK - It has all happened much too quickly. I am sad to leave Norfolk, Virginia and especially Lane and Jim, as they are amazing people. I hope that Lane and I stay friends as we gelled as people who are supposed to be friends do. What a woman! The Festival in its infancy was perfect, and it was such an honour to be at it’s the inception. I know that with Lane Dare, Stephen Israel and all of the other people who are behind it, it will go from strength to strength. Thanks Chris!